No…this is NOT Episode 69, dudes. We have a lot happening this month. We’re working on our final season (and yes we admit to be using the term “final” liberally…) of Tales from the Archives, work to do on Operation: Endgame, and planning a special two-part head-to-head episode here on the Shared Desk with in-studio guest Nick Kelly over a science fiction epic, and how it ended. However, we wanted to take some time and share with you this episode of the Geek Wolfpack Podcast, Nick Kelly’s premiere podcast featuring the entire Kelly family. (Give it a listen. It’s a hoot!) This particular episode features the Wolfpack Podcast’s first interview, their guest professional nerd and entertainment professional Elle Jensen, founder of the Nerd Out App. Elle sits down with Nick, Tee, and Pip to talk about the app’s Kickstarter campaign and how geeks of all backgrounds should be taking advantage of this wonder of technology! 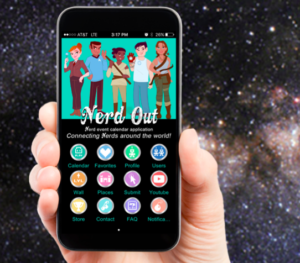 1:18 – Our Interview with Elle Jensen of the Nerd Out App! 3:06 – What exactly is the Kickstarter for? 7:15 – Where does the App team get their events? 11:12 – How are events vetted? 17:15 – What is the financial goal of the Kickstarter campaign? 18:15 – What questions does Elle have for Tee and Pip? 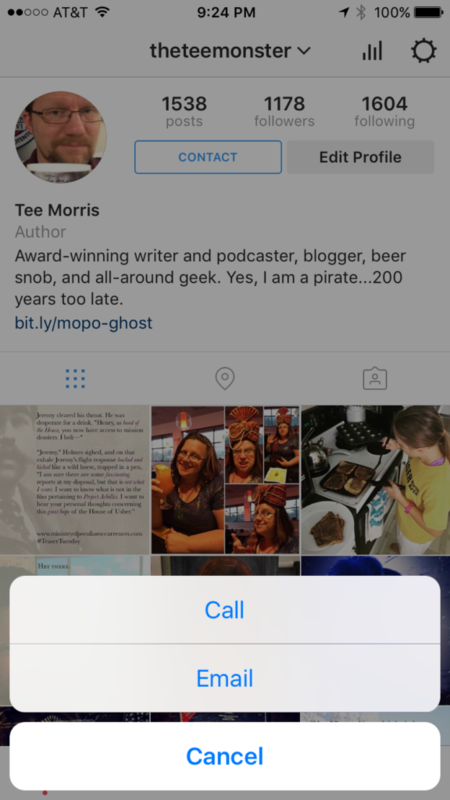 19:45 – What’s the frequency of posts? 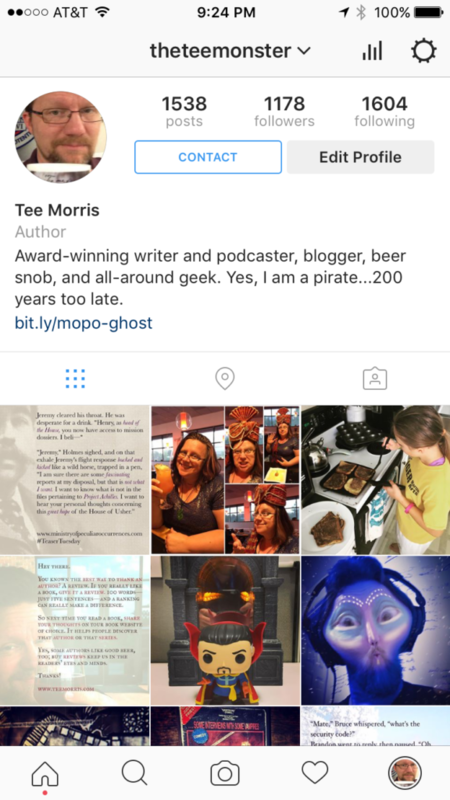 20:15 – How many posts are we boosting? 21:00 – What was Pip’s strategy in boosting posts? 21:33 – The West Coast Steampunk folks need to get posting more! 22:08 – What are the incentives? 24:28 – Stickers! Game of Thrones! Harry Potter! Deadpool! The Flash! Stranger Things! 29:20 – What are some personalization options for Nerd Out 2.0? 30:50 – You could be the nerd in the logo! 32:38 – Do you have a plan b? 42:55 – Thanks from the Wolfpack to Elle, Tee and Pip! 54:30 – Hey, Pharaxes, go set everything on fire! 55:39 – You want an arcana check? 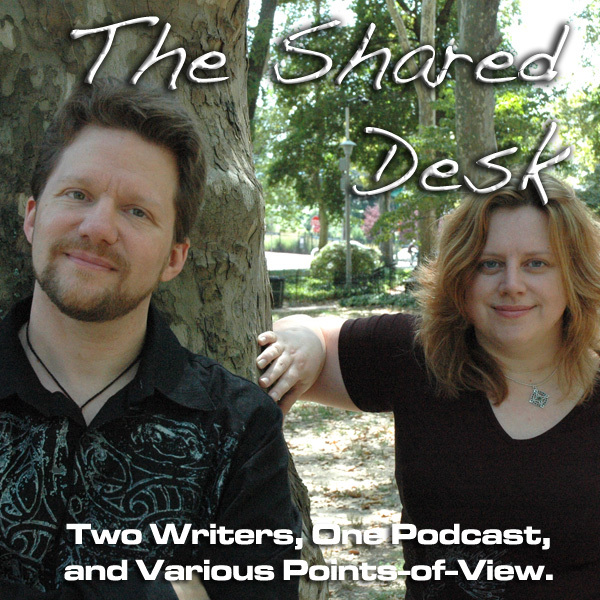 Social Media has been really busy since we last dropped a show for The Shared Desk, and as we agreed to do in our Social Media for Writers title, we’re going to talk about some of the changes happening as well as go into the best way to maximize your dollar on Facebook and other social media fronts. We’re rocking into the Sixties! Tee enjoys the Cute of Melissa Benoist while Pip gets a little homesick. The Hunt for the Wilderpeople. Scribe Approved! 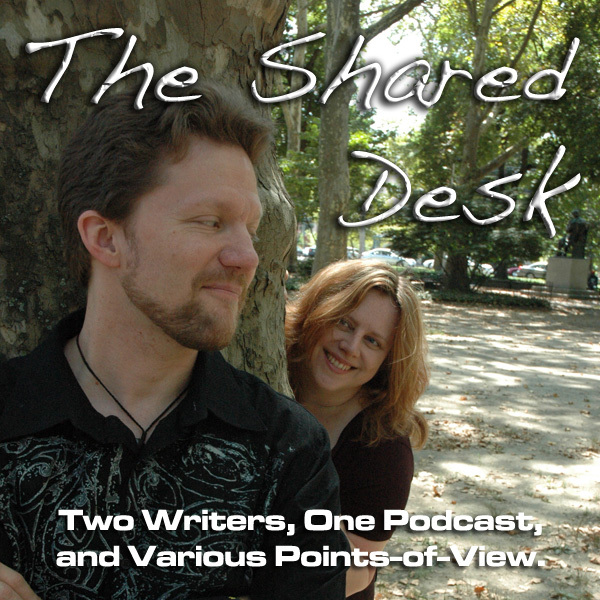 Thanks to author and sometimes-guest, Nick Kelly, Tee is recording with FireWire again! Today’s show is brought to you by Social Media for Writers. There have been some changes this week in favorite Social Media platforms. Cosmetic changes in how pins appear. Looking for the “Pin It” button? Look to you right. Yeah, we got great communication as a couple! …and chances are you’ve got new algorithms to figure out, too. Yes, Facebook saw record profits this year, but with a billion people using their service, they need to keep the lights on. A look back on the fun days of Organic Reach. If you want people to see content, it’s going to cost you. So BE SMART on what you boost. And when people dig your boosted posts, you should notice an uptick in Page Likes. Facebook’s Rules on text in images. Did you know that Facebook acquired Instagram? When jumping to a “Business Profile” you decide what you do and don’t share. 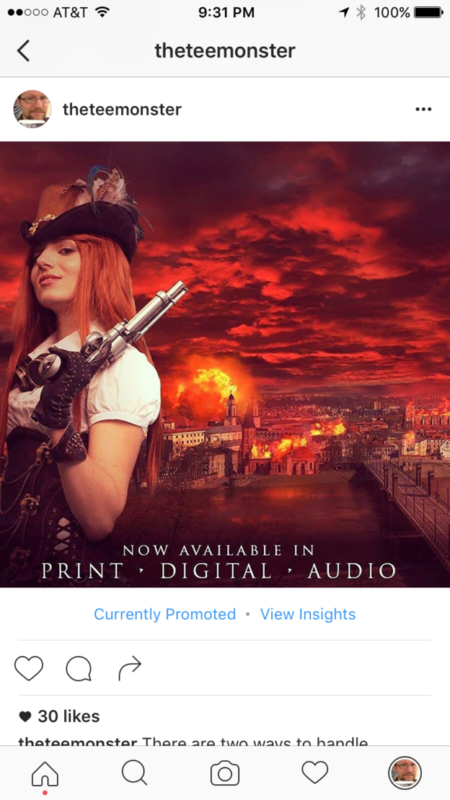 Now as a Business on Instagram, you can promote images like this…. CORRECTION: Text-heavy images like the #TeaserTuesday selections can be promoted on Instagram! There are a few hiccups to clear, but overall? WOW! 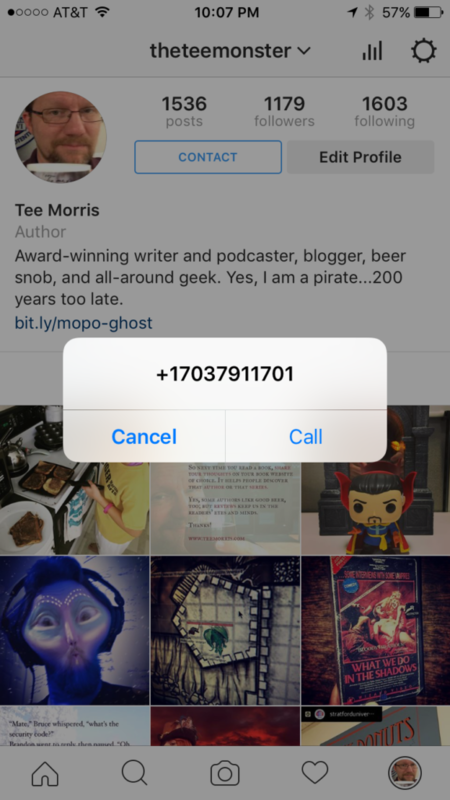 It was all thanks to Geektitude and the Average Geek Podcast where Tee discovered this new Instagram feature. You know all these Loot Crate items we’re setting aside as we’re not into that fandom? A contest that we’re announcing a winner at LaurenCon! Here’s what you have to do! Pulling back the Butterfly Girl to the topic on hand about what we’re doing with the Loot Crate stuff outside our fandom. A Futurama statue…and Tee thinks it’s pretty cool! Closing in to the end of 2016! 25 September, Tee is running the 2016 Dogfish Dash, an 8K race at the Dogfish Head Ale Brewery! We got projects reaching critical mass. Hopefully, news incoming. Weren’t we taking a break? BREAKS ARE FOR DUDES!